Today was a cold but beautiful winter's morning and early afternoon; the bright blue sky giving no indication of the promised weather ahead. My friend Colin and I had arranged to go and view the new L.S. Lowry exhibition at the Djanogly Art Gallery in the University Park, Nottingham. You can read a review of this exhibition from another Nottingham blog here, as it's much better than anything that I could do. 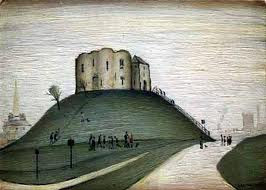 To learn more about Lowry, and The Lowry art gallery in Salford, click here. 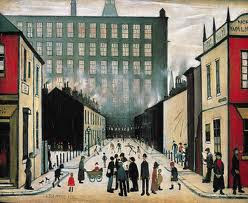 The only work of Lowry that I really knew was his famous depictions of industrial scenes around the Lancashire mills, with his painted people being described as 'matchstick men'. This does him an injustice, as there's much, much more to him than that. So here was an opportunity to expand my knowledge base, and perhaps to get a glimpse of the man behind the paintings. The Djanogly Art Gallery is named after Sir Harry Djanogly, whose family had fled Nazi Germany in 1936 for the safety of England. The family settled in Nottinghamshire, and Harry was born two years later. The family started in the textile industry, manufacturing stockings and hosiery, and the business grew into a multi-million pound empire. Though Sir Harry (he was knighted in 1993) maintains a low profile, he has been one of Nottingham's largest benefactors, being particularly generous towards education and the arts. Schools, colleges and both the University of Nottingham and Nottingham Trent University have benefited greatly from his generosity. The exhibition is in three different rooms at the art gallery, and once I'd got used to negotiating my way through scores of primary school children who were sprawled on the floor in front of paintings, I was able to enjoy the experience. The gallery promotional blurb says that the exhibition is "focusing on the artist's work from the 1920's to the mid-1950's. Includes early paintings and drawings of the industrial subjects that made him famous, and an extraordinary body of work produced under emotional strain in the years leading up to the Second World War. Troubled subjects such as his staring portraits, wastelands and derelict houses, form the dark underbelly to the good-natured portrayals of Manchester's working classes. They will come as a revelation to those who know Lowry only as the painter of the Lancashire mills". They certainly did to me. "The Pond" above was I think one of my favourite exhibits. It's a huge painting which dominates one end of the room, but many of his smaller sketches in another room were absorbing in themselves. Another painting that I enjoyed was his "View from Ancoats Hall, Manchester", painted in 1930. 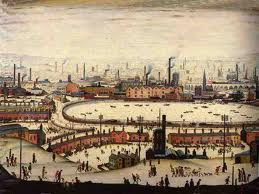 Ancoats Hall would have particularly been of interest to Lowry; he had taken to heart the work of Friedrich Engels, "Conditions of the Working Class in England" (1844), and many of his paintings depicted those conditions. Ancoats Hall was initially the home of The Manchester University Settlement, which was modelled on the first University Settlement that was established in London. The idea was, "that men and women from Universities lived amongst the poor and helped remove some of the inequalities of life". The Manchester Settlement is still going strongly today. L.S. 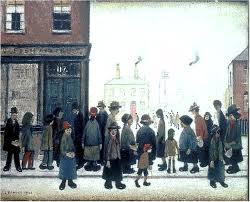 Lowry was born Laurence Stephen Lowry in Stretford, Lancashire in 1887, and lived in Pendlebury near Salford for over forty years. Success did not come easy, as he had to battle with some critics who thought of him as a naive 'Sunday painter'. 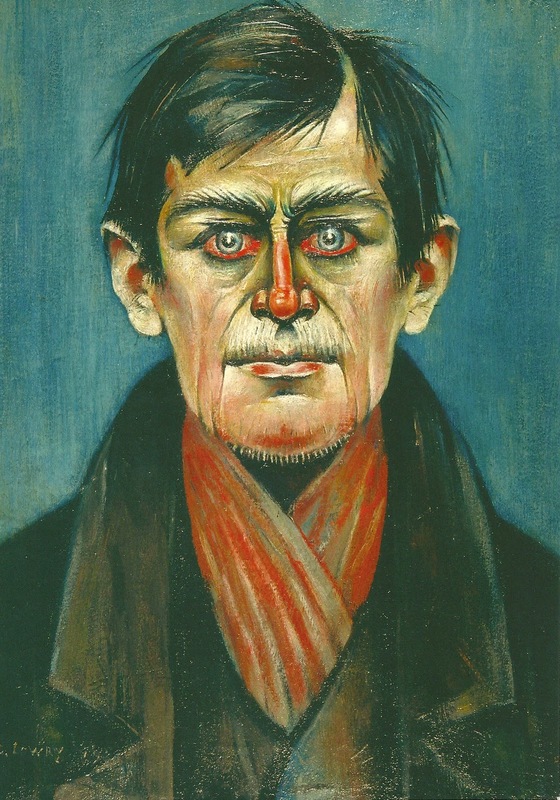 Lowry was irritated by people who thought he was an amateur painter, self-taught and untutored. He said, "If people call me a Sunday painter, I'm a Sunday painter who paints every day of the week". In fact, he attended art school, the reason why, he describes himself. "Aunt said I was no good for anything else, so they might as well send me to Art School". He began evening classes in 1905 in antique and freehand drawing, and was later to study at the Manchester Academy of Fine Art and at the Salford Royal Technical College. He greatly admired the Pre-Raphaelite movement, and as the L.S. Lowry web site says, "Far from being a naive Sunday painter, Lowry was an artist looking for his own distinctive way of painting and drawing - and for a subject matter he could make his own, preferring eventually the view from the Technical College window to that of the posed model". How did Lowry come to depict street life so well? A job that he kept quiet about was that of rent collector, which led to him walking all over the city. What did he see? "Children playing in the streets, people returning from work, going off to work, gossip on the front steps, incidents, market places and Whit processions". He said himself, "I saw the industrial scene and I was affected by it. I tried to paint it all the time. I tried to paint the industrial scene as best I could. It wasn't easy". Following his Father's death in 1932, Lowry was to spend the next seven years caring for his elderly, bed-ridden Mother, who completely ruled his life. She demanded his attention, and Lowry could only get to paint late at night. He said, "She did not understand my painting, but she understood me, and that was enough". Lowry observers say that these were years of isolation and growing despair, reflected in his paintings, where they depicted derelict buildings and wastelands "as mirrors of himself". When she died, painting was his "salvation". Success came with his first London exhibition in 1939 - the year his Mother died, but at the same time he was moving away from the subjects that people wanted him to paint - the subjects that had brought him success. It was his loneliness that brought about change. "Had I not been lonely none of my works would have happened". From this period there are some difficult pictures to like of solitary figures and down and outs. "I feel more strongly about these people than I ever did about the industrial scene. They are real people, sad people. I'm attracted to sadness and there are some very sad things. I feel like them". There is no doubt that Lowry was a complex and brilliant artist. On the one hand he paints crowds of happy people going to a football match, as well as happy families enjoying a day out at the fairground. On the other hand he paints brooding, staring portraits and unpopulated landscapes. This is what makes L.S. 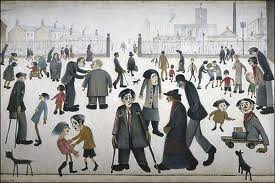 Lowry such a great twentieth century artist. I shall be back to the exhibition in the new year,as knowing what I do now should help me to understand and appreciate his paintings even more. It has been a really good day.